SAN FRANCISCO–(BUSINESS WIRE)–Room to Read, a global nonprofit focused on children’s literacy and girls’ education, held its annual San Francisco Benefit Dinner on October 11 in honor of International Day of the Girl, featuring Susan Wojcicki, CEO of YouTube and Room to Read board member; Anne Wojcicki, CEO and co-founder of 23andMe; and entertainer Lilly Singh. Bay Area technology, business and philanthropy communities came together to raise funds for Room to Read’s Girls’ Education Program which invests in the potential of young women around the world as they complete secondary school and develop key life skills, such as confidence and perseverance, to chart their own paths. All funds raised on the evening will be invested in Room to Read’s Girls’ Education Program currently operating in eight countries across Asia and Africa. The program is modeled on a long-term, holistic intervention that goes beyond academics to build the skills that girls need to negotiate key life decisions and complete secondary school. Room to Read’s Girls’ Education Program has benefited over 56,000 girls, changing gender paradigms in communities and strengthening support for girls’ education that will carry forward for generations. Remarks from Room to Read board member, Susan Wojcicki, alongside investor, Anne Wojcicki; Lilly Singh; and Room to Read Emeritus Board Chair, Hilary Valentine, highlighted the importance of mentorship and agency for young women, inspiring attendees to invest in the next generation of female change makers. 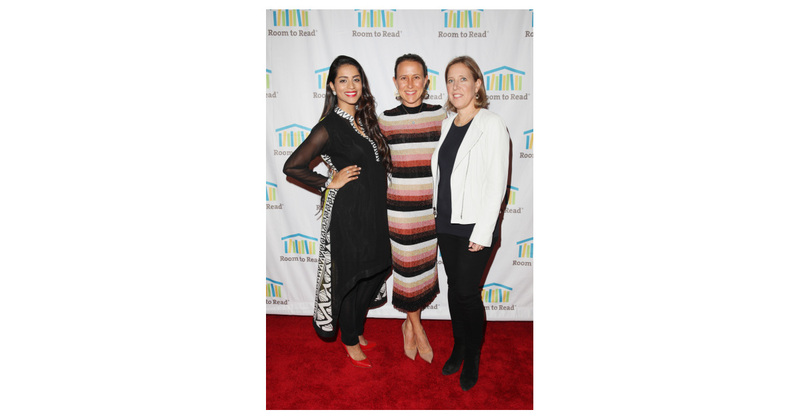 Susan Wojcicki and Anne Wojcicki announced a matching pool of $200,000 for all donations made towards Room to Read’s Girls’ Education Program through November 30. “I’m happy to invest my time in Room to Read and the change they’re making in the world, increasing opportunities for girls worldwide,” said Anne Wojcicki, CEO and co-founder of 23andMe. Founded in 2000 on the belief that World Change Starts with Educated Children®, Room to Read’s innovative model focuses on deep, systemic transformation within schools in low-income communities during two time periods that are most critical in a child’s schooling: early primary school for literacy acquisition and secondary school for girls’ education. We work in collaboration with local communities, partner organizations and governments to develop literacy skills and a habit of reading among primary school children and ensure girls can complete secondary school with the skills necessary to negotiate key life decisions. Room to Read has benefited 16.6 million children across more than 30,000 communities in 16 countries. Learn more at www.roomtoread.org.